I have selected the following bottled water facts that have been meaningful to me. If you come across other facts about bottled water that are relevant, please share them below. In general, bottled water is considered safe to drink in the U.S. Some bottled water is not tested for radioactive, chemical or biological contaminants. There are no federal filtration or disinfection requirements for bottled water. The task is assigned to the states, most of which have inadequate programs. Bottled water companies are not required to have their water tested by government-certified labs, whereas tap water is. Bottled water plants are only required to test for coliform bacteria once a week. Tap water must be tested 100 times a month. Bottled water sold across state lines is regulated by the FDA, which has much lower requirements for water regulation than the EPA’s guidelines for tap water. Evidence is conclusive that all bottled water contains at least some level of contaminants. Long-term consumption of even small amounts of certain contaminants can weaken the immune system and compromise health. Nearly 40 percent of all bottled water is re-processed tap water. With your municipal tap water, you can at least get an annual water quality report to know what contaminants you may be drinking. With bottled water, you never know what you’re getting. Most of the bottled water that is actually treated is usually filtered by reverse osmosis or distillation. 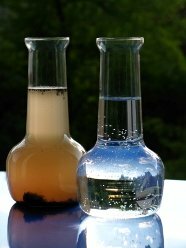 Both methods remove not only contaminants but also the naturally occurring minerals in water. Drinking de-mineralized water for any length of time is simply not healthy. Plastic bottles leach synthetic chemicals (such as pthalates) into the drinking water. The longer the water sits in bottles—in the bottled water plants, throughout the distribution process, and on store shelves—the more likely the chemicals will leach into the water. Exposure to heat will increase leaching of chemicals, especially when bottled water is taken outdoors, left in cars on warm days, etc. Bottled water purchased in stores ranges between $1.00 and $4.00 per gallon. Compare this to tap water, which costs about $0.003 per gallon. Bottled water that is delivered to homes costs on average $1.50 per gallon. These bottled water facts should be enough to convince all consumers to say NO to bottled water, especially since most bottled water is just expensive tap water. Even though some people recycle water bottles, over 86 percent are thrown away. Over 1.5 billion tons of plastic water bottles end up in U.S. landfills each year. It takes over 300 years for plastic to degrade. Bottled water wastes fossil fuels and water in the production and transportation processes. In the U.S. over 47 million gallons of oil are used to produce plastic water bottles. BusinessInsider.com: 15 Outrageous Facts About the Bottled Water Industry; 2011.